WAKE FOREST, N.C. (WNCN) — A Wake Forest mail carrier went above and beyond to save packages from a fire last month. 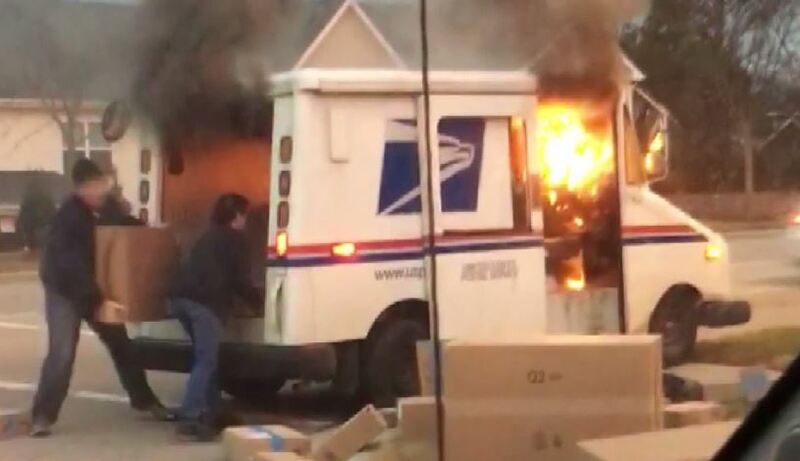 Cellphone video captured her grabbing the packages from the back of her burning United States Postal Service truck. “Now that I think about what I did, I’m like ‘wow’,” said mail carrier Araceli Santiago. Despite a 911 dispatcher telling her to get away from the vehicle, Santiago kept taking the boxes out. “I said ‘I hope I don’t get in trouble for that one’,” Santiago told CBS North Carolina. Not a terribly smart move. A vehicle fire can get out of control FAST, and Where TF do you think the gas tank is? Right; at the rear of the truck.